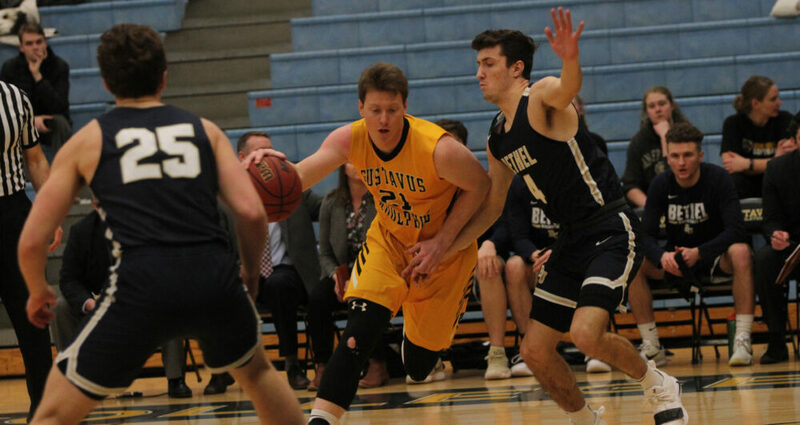 SAINT PETER, Minn. – The Gustavus men’s basketball team played host to Bethel for Senior Night Wednesday and lost 84-81. With the loss the Gusties fall to 10-14 overall and 7-12 in league play. In the contest the Gusties got out to a hot start as Isaac Douglas (So., Montevideo, Minn.) poured in eight points in the first four minutes to propel them to a 12-5 lead. The two teams continued to battle throughout the half with a Riley Sharbono (Sr., Marshall, Minn.) three-pointer with 8:32 left in the half giving Gustavus their biggest lead of the game at 31-20. The Royals fought back though and were able to close out the half on an 18-9 run to head into the break trailing the Gusties by just two. In the first half the Gusties were 18-of-35 from the field for a percentage of 51.4 percent while the Royals were 17-for-32 for a 53.1 percent clip. In half number two the Gusties were able to maintain their lead a majority of the half with Sharbono catching fire and pouring in 15 second half points. Gustavus clung to a five-point lead with 3:32 to play where the Royals drew up a play that got them a backdoor for a dunk that swung the momentum their way. Trailing by three with under three minutes to play, Bethel was able to come away with two points on their next four possessions to take a five-point lead. Gustavus got a layup to pull it within three and pulled it within one on their next possession but Bethel was able to evade getting fouled until their was two seconds left on the clock. The Royals knocked down both free throws, and the Gusties were unable to get a shot on their last possession. In the contest, Sharbono led all scorers with 22 points on 9-of-15 shooting, to go along with three rebounds. Douglas finished with 14 while Marten Morem (Fy., Caledonia, Minn.) was the other Gustie in double figures with 10. The Gusties will travel to Concordia on Saturday for a 3 p.m. contest with the Cobbers.